Proper training is essential for quality single-ply roof installation. If you think you know everything about FiberTite single-ply roofing, think again! Unlike low-cost commodity-driven roof systems, a high performance FiberTite roof is part of an overall roofing system that requires a higher level of product knowledge. Even the most experienced FiberTite single-ply roofing contractor can benefit from a refresher course. 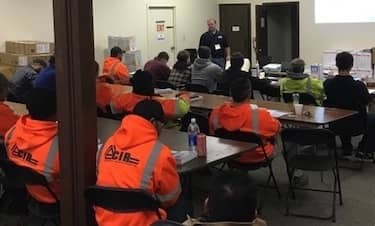 FiberTite kicked off 2017 with a Contractor Quality Assurance Training program.Trainings have been held in Seattle, WA; San Jose, CA; Phoenix, AZ; Houston, TX; Nashville, TN; Chicago, IL; Columbus, OH and United Kingdom. 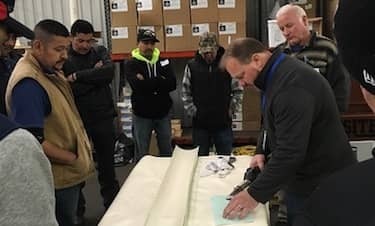 These free, one-day seminars focus on the quality installation of FiberTite Roofing Systems and are designed to help contractors build skills that enhance their knowledge of many FiberTite systems. The seminars provide a balanced approach to training, using both classroom learning and hands-on practice. Pitfalls when a quality control process is not followed. During the hands-on training segments, we walk through the topics discussed. A roof assembly is installed on a mock up roof deck and detail mock ups are presented for practice. We pay special attention to repetitive deficiencies found in the quality assurance inspection process and show tips on how to avoid these in the first place. We’ve also found that this a great way to further engage the contractor in a team building experience. The response to the seminars has been outstanding and we have had a record number of contractors in attendance. If you would like more information on the FiberTite Contractor Quality Assurance Training Program please contact Gary Pelton at gpelton@seamancorp.com.